Kodak has unveiled new compact cameras to sit in its Easyshare and Playfull range, along with two new apps for creating albums and prints. The first camera, the Kodak Easyshare M750, enables users to share pictures instantly. Using the Kodak Easyshare app on Android, Apple or BlackBerry devices enables pictures to be sent wirelessly to Facebook, Kodak Gallery and email, as well as emailing pictures to compatible Kodak printers. The camera also works with home Wi-Fi networks. Other features include a 16 megapixel sensor, 5x optical zoom and a 3-inch touchscreen. Meanwhile, the Kodak Playfull Dual Camera combines a 1080p HD video camera capable of recording at 60fps with a 12MP BSI CMOS sensor digital camera in one device. It also has an external microphone jack, built-in Xenon flash and share button for easily uploading to social networking sites. The camera uses the same image sensor found in Kodak's flagship superzoom model, the Easyshare Max Z990, the Dual's CMOS technology promises to deliver a unique set of creative capabilities never before seen on a Kodak compact camera. Capable of recording video at up to 240fps, the camera is designed for analysing things such as golf swings or birds in flight. It features a dedicated camera button to quickly snap a 12MP still photo without the need to sort through menus. 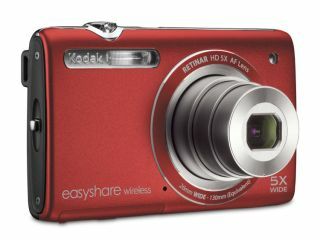 The Kodak Easyshare Wireless Camera M750 Wi-Fi camera UK price will be around £129.99 and will be available in red or silver from the spring. The PlayFull Dual Zi12 Pocket Video Camera UK price is around £159.99, and will be available in black or white from spring. Two new apps were also announced. The My Kodak Moments app enables the effortless creation of a premium photo book from your own and friends' Facebook albums and have it delivered. The Kodak Photo Collage Print app is the first photo collage home printing app on Facebook, enabling you to create a photo collage that can be printed at home.